The real name of the “Birdman” was Robert Franklin Stroud. 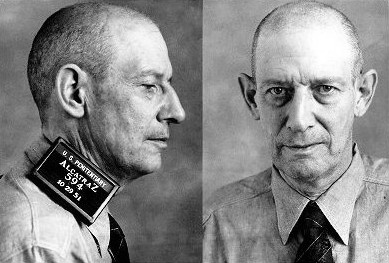 Seattle born Stroud ran away from home at the age of 13 and was first arrested in 1909 at the age of 19 after turning himself in for murder. He shot and killed a bartender, F. K. Von Dahmer, who had allegedly failed to pay a prostitute for whom Stroud was pimping for in Alaska. He was then sentenced to 12 years in a federal prison, though not in Alaska as it wasn’t yet a state. After these two incidents, an additional 6 months was added to his sentence and Stroud was shipped off to a different federal penitentiary in Leavenworth, Kansas. It would be here that he earned the nickname “Birdman”. He continued to be a difficult inmate to handle in Leavenworth and frequently threatening other inmates. In 1916, about half way through his original sentence, Stroud got in trouble over a minor incident, and thus, was going to be denied a visit with his younger brother who he hadn’t seen in 8 years. Needless to say, he was furious over this and in a fit of rage, he stabbed the guard responsible for reprimanding him and killed him in front of about eleven hundred inmates in the Mess hall. Needless to say, the fact that it was his second murder and that there were so many witnesses, Stroud didn’t receive such a light sentence as the first time- this time being sentenced to death by hanging. During this time, he was put in solitary confinement. However, a series of court battles ensued, twice involving the Supreme Court, and his proposed execution was postponed all the way until 1920. At this point, a handwritten desperate plea by Stroud’s mother to President Woodrow Wilson earned Stroud a commuted sentence of life in prison; but because he was viewed as such a violent inmate, it was recommended by the warden that he continue to serve out that sentence as he had done since killing the guard, in solitary confinement. This was instituted and he was put in permanent solitary confinement. Over the next 30 years in the Leavenworth penitentiary, he came to be known as “Birdman” as he started taking a keen interest in canaries and other birds after he found an injured bird in the recreation yard and nursed it back to health. After that, he started breeding birds and studying them in his cell, an activity the guards allowed him as it was a hobby they thought to be a productive use of his time. He also earned money by selling the birds and used it to help support his mother, as well as to purchase various supplies for himself to support his bird hobby. He checked out every book available on the subject of birds that the prison library offered. It wasn’t long after this that Stroud became a genuine world class expert on the subject (ornithology) and redirected his energies to writing about them. Having raised hundreds of birds (mostly canaries) in his cells, studying their behavior, habitat and physiology, he managed to author two books titled Diseases of Canaries and Stroud’s Digest on the Diseases of Birds, where he even outlined cures for certain diseases that he himself had discovered. He was also in regular correspondence with some of the world’s leading ornithologists. In fact, he wrote and received so many letters that the prison had to hire a full time secretary to read and copy all of them, as it was prison policy that every piece of mail in or out had to be read and copied, to make sure there was nothing illicit about the correspondents and keep a record of them. Needless to say, his amazing number of letters that had to be screened and the filth from all the birds in his cell resulted in the prison administration trying to shut down his business. Thanks to a bird researcher from Indiana, Della Mae Jones, his story made newspaper and magazine headlines and the President even received a 50,000+ signature petition from people all over requesting that Stroud be allowed to keep the birds. Thus, rather than be able to force him to get rid of the birds, this resulted in the prison administration begrudgingly giving him a second cell to house his birds in. They then switched strategies and simply set about trying to get him transferred to a different prison. They were at first unsuccessful, because when he got wind of this, he married Della Mae Jones. Why? Because there was a Kansas state law prohibiting any prisoner married in Kansas from being transferred. After several years, the prison administration was finally able to get him transferred and his birds and equipment taken away when it was discovered he was using some of his equipment to distill alcohol. They then shipped him off to Alcatraz, where he was given his famous moniker “The Birdman of Alcatraz”, even though he was never allowed to keep any birds while there. In his 17 years in Alcatraz, still in solitary confinement, among other things, he studied law with an aim at securing his release; his argument being that being kept in solitary confinement for so long constituted cruel and unusual punishment. He also wrote two more manuscripts, an autobiography titled “Bobbie” and one called “Looking Outward: A History of the U.S. Prison System from Colonial Times to the Formation of the Bureau of Prisons“. In 1959, the famous Birdman of Alcatraz, who never actually had any birds there, was finally released from solitary confinement for the first time since 1916 due to his poor health. He was ultimately transferred to the Medical Center for Federal Prisoners in Springfield, Missouri where he died at the age of 73, having spent the last 54 years of his life in prison, of which 42 were in solitary confinement. WOW! THAT WAS SOMETHING. TNX NOREEN. Great article and very interesting. Good to see that with proper motivation even the coarsest of beings can accomplish something of value.